are super easy to make and your kids could make a whole collection of characters. Then they can put on a puppet show for family and friends. Pick a felt color. You will two pieces of the same color. Put your hand down. Trace loosely around your hand, not around each finger. Cut this piece of felt out. Trace this piece of felt on to another felt sheet of the same color and cut it out. Glue these pieces together at the edge leaving the bottom open for a place to put your hand. If older kids are doing this project you could use needle and thread to sew the two pieces together. Use your felt colors and scissors to cut out eyes, eyebrows, mouths, noses and whatever else you want your puppet to have. You could make a hat, tie or even a mustache for your puppet. Get creative! Then glue these pieces on to your puppet. Have the kids put on a puppet show for family and friends using a Kidkraft majectic mansion. 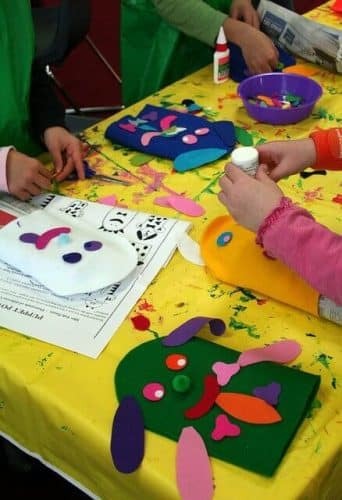 This craft will keep them busy and get them to think creatively and use their imaginations! Happy crafting!